Stairways, Inc. works with landscape architects, deck contractors, designers, architects, builders and homeowners for their exterior spiral stair needs. In an outdoor kitchen or by the pool, our spiral stair kits will add convenience and be an eye-pleasing focal point. If you are rising one floor, Stairways, Inc. will look at your floor plan and design a spiral stair to have you heading in a comfortable walk path on both the top and bottom. We can change steps, balusters and handrails to combinations that will suit your design style. Multiple floor levels can be transverse using a single center column. Aluminum, steel, galvanization, and stainless steel are available options for standard spiral stair kits. 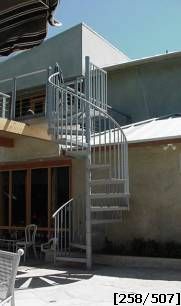 Contact Stairways, Inc. and we will design a spiral stair that will give a finished look to your outdoor area.